Louis XV, pastel by Maurice Quentin de la Tour, Paris, 1748 (left) and Madame de Pompadour, oil painting by François Boucher, Paris, c.1750 (right). Both works are now in the Louvre, Paris. 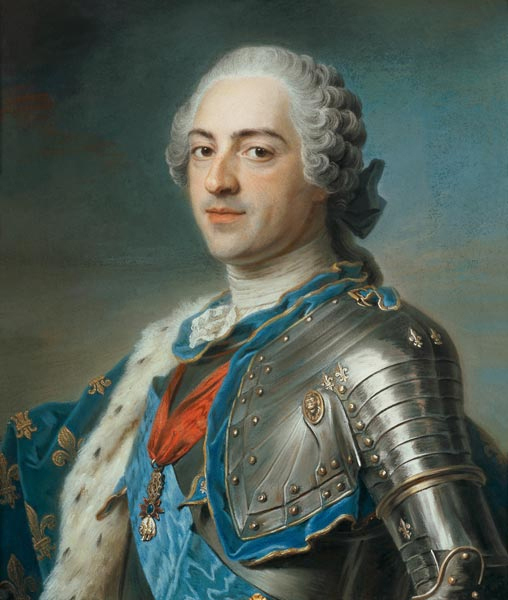 Louis XV was a great patron of the arts and commissioned both François Boucher and Christophe Huet for many works, including possibly the decoration of the Franco-Flemish harpsichord. It seems highly likely that he commissioned the painting of his petite maîtresse (little mistress) Marie-Louise O'Murphy on the lid of The Franco-Flemish harpsichord sometime after the first grand ravalement of 1750. Indeed who else, other than Louis XV himself, would have the King's mistress painted on their harpsichord?? Madame de Pompadour, Louis XV's grande maîtresse en titre (titular primary mistress), also commissioned numerous works of art, architecture, sculpture and design for the French court around the time that the Franco-Flemish harpsichord was ravalé in 1750. Basically she organised practically all of the activities of the French Court and particularly its domestic and social side. She even took painting lessons from François Boucher himself. 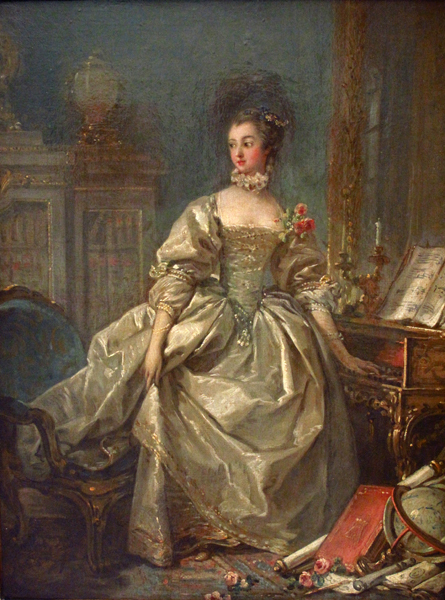 In the portrait on the right above Madame de Pompadour is pictured in regal splendour with her left hand touching the keys of a harpsichord which is placed on a high stand so that she doesn't have to bend over to touch the keys. She is known by historians as having been an excellent harpsichord player and she was, for example, a friend of Madame Anne-Jeanne Boucon de Mondonville (1708 -1780) who was a good musician and an excellent composer in her own right - one of the Pieces de clavecins en concert, 'La Boucon' by Rameau was dedicated to her. Madame de Pompadour was also a patron of Madame's husband Jean-Joseph Cassanéa de Mondonville (1711–1772). Mondonville is known particularly as a compose of Grands motets, but also for his keyboard compositions. He championed the French style over le style italien which many felt was encroaching on and threatening the style of the French court. Mondonville was therefore well treated by both Louis XV and by Madame de Pompadour. There are many similarities between the harpsichord in the painting on the right and the Franco-Flemish harpsichord. The instrument in the Boucher painting of Madame de Pompadour is a clavesin ordinaire or a smaller compass, single-manual harpsichord, and not a grand ravalement double-manual 5-octave instrument. The roccoco decoration on the cheek of the harpsichord in gold vernis martin is very similar to the Christophe Huet decorations on the Franco-Flemish instrument. The stand seems identical. In 1750, at the time of the painting of Madame de Pompadour, the Franco-Flemish harpsichord would almost certainly have had the compass F1 to d3, and so would have been considered a clavesin ordinaire at least from this point of view. It would also almost certainly have had black, ebony-topped naturals with bone-topped sharps as seen in this painting. The keywell is painted a solid red colour which is probably vermillion. Unfortunately any trace of this red decoration would have disappeared when the nameboard was replaced in the second grand ravalement which occurred in 1786. The only notable difference between the harpsichord in the painting and the Franco-Flemish harpsichord is that the instrument in the painting has only one keyboard, whereas the latter has two. There is no way now of knowing if the instrument in the painting really is a different harpsichord or whether the harpsichord was painted with one keyboard as artistic license on the part of Boucher. Was Boucher too rushed or perhaps, too lazy, to paint in the second keyboard (a feat that is not easy to depict correctly and get the perspective right with keys separated so that they 'read' correctly with two sharps followed by 3 sharps and with the keys of the upper manual aligned correctly above those of the lower manual). The large number of features that the Franco-Flemish harpsichord shares with the instrument in the Boucher painting strongly suggests that they are indeed one and the same instrument. Even the height of the stand, which is greater than usual, suggests that this is, indeed, the same instrument with the same stand.